These are a staple after-supper treat at most of my suppers. They are without any doubt the most delicious chocolate recipe that I have made and they are so simple to make! It’s literally a case of melting, stirring, spooning, sprinkling and chilling. 1. Melt the chocolate in a heatproof bowl set over a saucepan of simmering water (don’t let the base of the bowl touch the water). 2. Remove the bowl from the pan and stir half the pistachios and all the rosewater into the melted chocolate. 3. Place separate dessert-spoonfuls of the chocolate mixture onto a sheet of baking paper and form into even-sized rounds. 4. 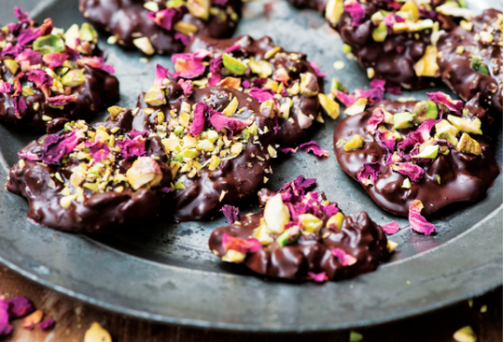 Sprinkle the remaining pistachios and the dried rose petals on top, then gently press into the melted chocolate. Chill in the fridge for an hour until set. This is my all-time favourite summer dessert! It is so decadent in flavour and looks absolutely fabulous – everyone loves it! I love the flavour of rosewater and its gentle floral taste works perfectly with the light and fluffy pavlova. I also make the pavlova the evening before and leave it to cool overnight in the oven (after it’s turned off). This dish is also delicious with strawberries or peaches when they are in season. 1. Preheat the oven to 160°C/gas mark 3, and line a baking tray with greaseproof paper. 2. First make the syrup. Combine the raspberries and sugar in a small saucepan, place over a low heat and stir until the sugar has completely dissolved. Cook for a further 2-3 minutes until the raspberries have turned to mush. Transfer the raspberries to a sieve over a bowl and push them through the sieve using the back of a spoon to create a thick, syrup-like consistency. Leave to cool. 3. To make the meringue, place the egg whites in a very clean and dry large bowl or the bowl of a stand mixer and use an electric hand whisk or the whisk attachment on the stand mixer to whisk until firm peaks form. Gradually add the caster sugar, a tablespoon at a time, whisking constantly until the mixture is thick and glossy and the sugar has completely dissolved. Then add the cornflour, vinegar and rosewater and gently fold in until just combined. 4. Spoon the meringue onto the lined baking tray to form a round and use the back of a wooden spoon to shape the meringue into a nest. Using a teaspoon, drizzle half the raspberry syrup around the meringue to create a ripple effect. 5. Place the meringue in the oven, reduce the oven temperature to 140°C/gas mark 1, and bake for 1½ hours. Then turn off the oven, open the oven door and leave the meringue to cool completely. 6. When the meringue has cooled and you are ready to serve, start assembling the filling – you don’t want to add it too far in advance, as it will soak into the meringue. Gently whip the cream in a bowl until it thickens and then whisk in the icing sugar. Fold in the rosewater. Spoon the filling into the centre of the meringue, arrange the fresh raspberries on top and drizzle over the remaining raspberry syrup. A true autumnal hero! I came up with this recipe as I had an abundance of figs from the tree in my garden, and I absolutely love a sticky toffee pudding – so this is a little similar in flavour but much lighter. 1. Preheat the oven to 180°C/gas mark 4. Grease a 30cm springform cake tin. 2. Place the dates, dried figs and water in a saucepan over a medium heat and bring to the boil. Then reduce the heat and simmer for 30 minutes. 3. Remove the pan from the heat and leave the date and fig mixture to cool for 10 minutes, then transfer to a blender or food-processor and blend to a purée. Set aside. 4. Place the butter and sugar in the bowl of a stand mixer or a large bowl and use the paddle attachment on the stand mixer or an electric hand mixer to beat on a high speed until pale and fluffy. Add the eggs, one at a time, beating well after each addition, then beat in the vanilla extract. Fold in the flour and bicarbonate of soda, followed by the date and fig purée. 5. Pour the cake batter into the greased tin. Slice the fresh figs and place in a fan arrangement on top. Bake for 50-55 minutes or until golden brown and a skewer inserted into the centre comes out clean. 6. Remove the cake from the oven, then release the cake from the tin, transfer to a wire rack and leave to cool completely. 7. Meanwhile, make the frosting. Place the cream cheese and icing sugar in the bowl of the stand mixer or a large bowl and use the paddle attachment or an electric hand mixer to beat together on a high speed until well combined, light and fluffy. 8. Spread the frosting on top of the cooled cake. To decorate, arrange the halved figs on the frosting and zest the orange over the top. Lastly drizzle the honey over the cake. * Extracted from Clodagh’s Suppers by Clodagh McKenna, published by Kyle Books, £20. Photography by Dora Kazmierak. Clodagh McKenna is a consummate cook, and a romantic one too. The Cork-born writer and broadcaster dedicates her latest book, “to my true love, Harry Herbert.” Clodagh says she is never happier than seeing her loved ones sitting around the table with smiles on their faces as they enjoy delicious home-cooked food in a beautiful setting. She recommends lovely romantic touches like sprigs of branches, herbs or flowers along the table with ambient candles dotted throughout, dried lavender on everyone’s napkins, or figs with place settings popped in aslit of the fruit. For tips on successful entertaining, she recommends “keep it simple and cook the dishes that you love the most”. Candles lit, playlist on, table laid, food cooked, all that’s left is to make yourself a delicious cocktail and let it be a night to remember.